Minnesota would have to generate half its electricity from renewables by 2030 under a mandate proposed Monday by the Dayton administration, a doubling of the state's current renewable standard. Wind and solar now account for about 21 percent of the electricity total, putting it ahead of schedule for reaching the state's 25 percent by 2025 goal. "If you don't set big goals for where you're trying to get to, you never get there," Lt. Gov. 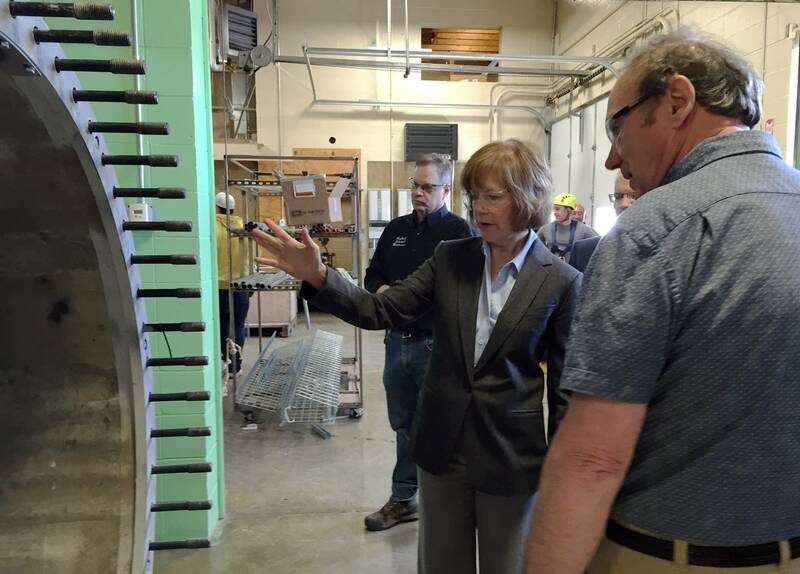 Tina Smith said as she announced the proposed 50 percent renewable standard. 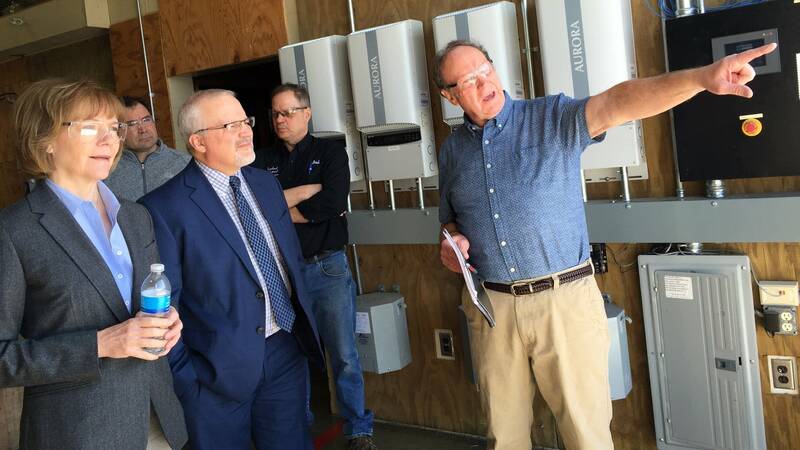 Smith made the announcement at Riverland Community College in Albert Lea, a campus where the potential for renewable technologies is on full display. "The nice thing about it is these students can go many different directions," said Steve Vietor, who runs the college's renewable energy program. Lately, renewable energy job growth has been outpacing other sectors of the state's economy. According to Dayton administration officials, clean energy jobs grew by 78 percent in Minnesota between 2000 and 2014 compared to 11 percent overall. Their analysis shows the industry supports more than 15,000 jobs and creates $1 billion in economic activity. When Riverland student Noel Ruiz was pursuing his GED in Austin, his teachers helped him look up which careers had promising job prospects. "I looked on wind turbine technology and it was just skyrocketing up and I decided to go for it," he said. Ruiz has been working at the Hormel plant in Austin for the past four years, but the 25-year-old says he's enthusiastic about working in renewable energy because it's important for the environment. Smith said further tapping into the wind and sun instead of fossil fuels presents an economic development opportunity to the state. She says it gives a road map to utilities, companies, and even training programs like Riverland's. "That kind of predictability is gained when we can all come together and set a clear goal, which is what I hope we do on the renewable energy standard," she said. But the politics over renewable energy have changed dramatically since 2006, when Republican Gov. Tim Pawlenty signed Minnesota's first renewable energy mandate. It called for 25 percent renewable energy by 2025. Back then, gas was more expensive and we were worried about relying too heavily on foreign oil and natural gas. But Republicans like Pawlenty were also talking about climate change as real and in need of bold action. Today, it's hard to find many Republican politicians who would say that. Two Republicans have signed on to the latest renewable energy proposal, but neither is in a position to ensure the bill even gets a hearing in the Republican-controlled Legislature — they don't sit on the House or Senate energy committees. And at least one legislative energy leader says he opposes the proposed mandate. "There is bipartisan opposition to increasing energy mandates in Minnesota," said Rep. Pat Garofalo, R-Farmington, who chairs the House energy committee. "There's a lot of concern, particularly among rural legislators, about what an energy mandate is going to mean to reliability and cost," he said. "So going forward, I think it's more along the lines of achieving both cleaner and cheaper energy, not just one or the other." Smith acknowledged the latest effort faces an uphill battle. But she says she hopes people also think about the costs to public health and the environment if the state continues to rely heavily on fossil fuels. While Minnesota is meeting its renewable energy law, it's behind on goals to reduce overall greenhouse gas emissions. Those come not only from power plants, but also from cars and trucks, agriculture, factories and landfills.